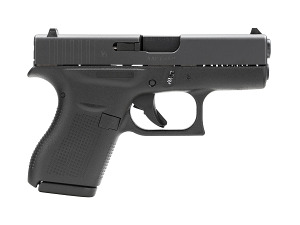 Consumers asked and Glock delivered, the Glock 42 is a slim, compact .380 that is the perfect deep concealment pistol. The smallest Glock ever made, the single stack .380 features a 6+1 capacity in a grip that features a Gen-4 style texture for a sure grip in any condition. A dual recoil spring assembly allows for reduced recoil and increased service life. Comes with all of the usual factory accessories, including box, manual, lock and two 6 round magazines. This gun is fantastic. It feels great in my hand and with the standard Glock sights, it is very target friendly. I've shot over 500 rounds through this gun without a single problem. I strongly recommend you buy the Glock 42.